The vision plan that grew out of the charrette focused on North Main Street and the transit station area. This includes the design of a regionally appropriate plan for the public realm, a form-based code, emphasis on transit-oriented development, smart growth opportunities and a structured implementation plan. 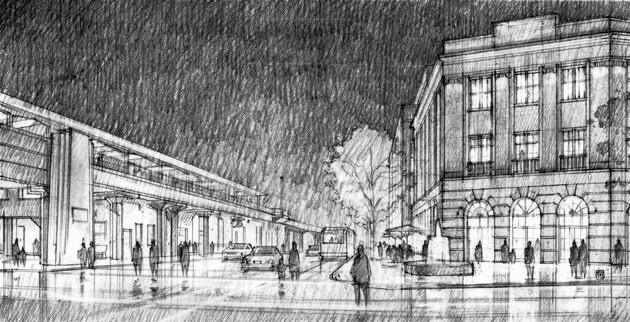 An illustrative vision plan document describes the nature of the renewed main street corridor, leveraging new development and preservation to reestablish safety, economic vitality, pedestrian connectivity and community place-making. The project is being undertaken through the joint efforts of Moule & Polyzoides, the Regional Plan Association and Sustainable Long Island.